Fermenting Fun & Magic Food Preservation ! Taste test, see demo, experience hands-on, and take home starters … Kimchi, Butter, Honey Mead, Sour Dough Wraps, Nixtamalizing Corn, Dehydrating apples & more ! YUM ! Tour the enchanting Strawbale Studio & grounds and see thatched roofs, earth plasters, earth oven, rocket stoves + ! $35 Early Bird Special Paid in Full by Feb. 24 – 1 month in advance) $40 thereafter. Bring-A-Friend ~ $5 off each. 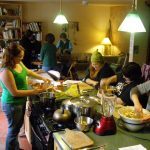 Optional: also attend the Eco-Cooking Class on Sunday March 25th, the next day. $5 discount for attending both days. Overnight and meals just $10 extra !